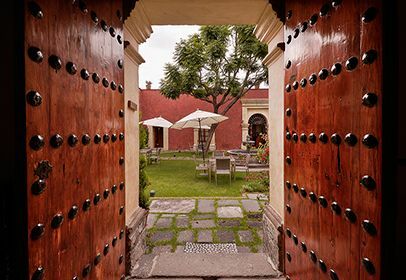 Ensconced in a beautiful 17th-century home, La Quinta Luna´s enviable location in Cholula, the American continent´s oldest city, allows you to discover a different world. Visit the colorful local market, myriad historical, religious and artistic sites, the second-highest volcano in Mexico and one of the largest pyramids in the world. An added delight: the hotel´s excellent cuisine. 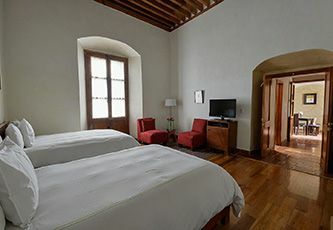 La Quinta Luna is a beautiful 17th-century mansion that originally belonged to pre-Hispanic indigenous nobility, which has been rescued by the Cardenas Gonzalez de Cossio family in an effort to preserve history and share it with their guests in its new incarnation as a hotel. 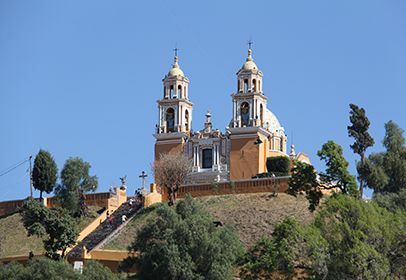 Deemed a historic monument by the National Institute of History and Anthropology, La Quinta Luna proudly shows its original structure in Cholula, the oldest living city on the American continent. A grand arcade of illuminated arches unfolds before you and welcomes you within. A focal point of the estate, and testimony to the family´s commitment to their heritage, is the lofty library built with 400-year-old wooden beams rescued during the restoration. It houses a rare collection of 3,000 books covering subjects from design to economics and Mexican artists to historical books of colonial and pre-Hispanic Mexico. 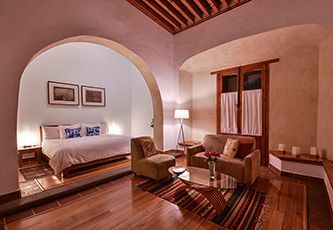 Against a backdrop of thick adobe walls and high beamed ceilings, guest rooms and public spaces contrast the traditional with modern furnishings and artwork, lending color, form and serenity. 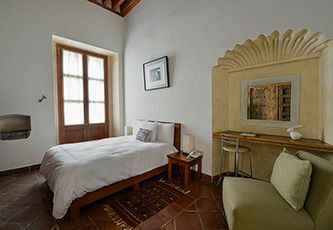 The hotel´s restaurant is set where the original chapel was situated and, as well as presenting exceptional art pieces in this space, there is a carving of colonial origin and a finely preserved wooden ceiling in which a beam is dated 1736. The eclectic experience is furthered by an exquisite menu that offers a mix of local specialties prepared with traditional ingredients, innovative variations of Mexican favorites, as well as international specialties that continue to contrast the traditional with the contemporary. As well as its restaurant, guests may choose to dine on the patio or within the ambiance of their own guest room. 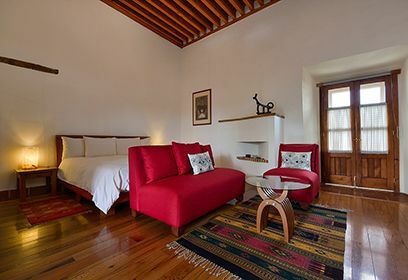 This beautiful home exudes culture and spirit and provides the perfect hideaway for complete relaxation after a day spent exploring mystical Cholula or the vibrant city of Puebla. From the haven that is La Quinta Luna, you are minutes away from many sites of historical, religious or artistic interest. 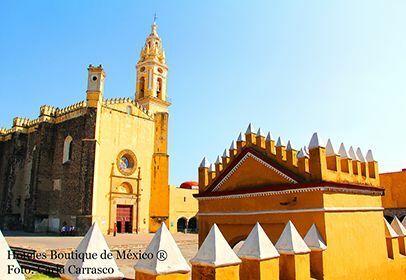 In addition to the magnificent architecture, one can observe the second-highest volcano in Mexico, walk a few blocks to one of the largest pyramids in the world or take a short drive to downtown Puebla´s exciting zocalo, lined with Talavera ceramic shops and other interesting Mexican handcrafts. Spending a few nights in ancient Cholula and a few more in the city of Puebla will give you a great perspective on the destination. 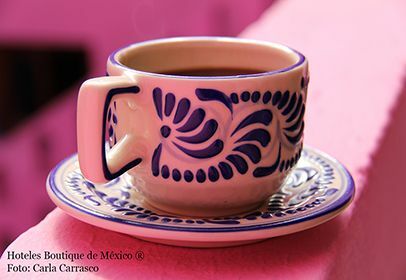 You may also consider adding Oaxaca to your itinerary, as it is only a few hours away on a breathtaking route. The food! A menu that creatively blends contemporary presentations and tasty local ingredients. 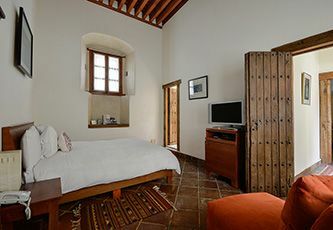 Guest rooms lie within thick walls and high ceilings. A very strong contrast exists between the exquisite classical colonial arquitecture and the contemporary pictorial Mexican art that dresses the walls, as well as the equally contemporary furnishings. Heater, direct telephone line, in-room Internet access, TV, DVD, safety deposit box, mini-bar, coffee maker, bathrobes, slippers, hairdryer, scale. Note: Rates are quoted in US dollars and are subject to change without notice. Please note that hotels will charge in Mexican pesos at current exchange rate when payment is processed. We invite you to contact us if you need rates for the following year and do not see them on our site. Garden view with queen bed, full bathroom. Street view with queen bed, full bathroom. Garden view with King size bed, small living room area and full bath. The bathroom has a beautiful bathtub framed with a niche in shell form covered by different shapes and color mosaics. Street and garden view, two double beds, kitchenette, full bath. Street view, queen bed, fireplace, full bath. This luxurious and large room has one king size bed, lounge area, fireplace and a flat-screen television. 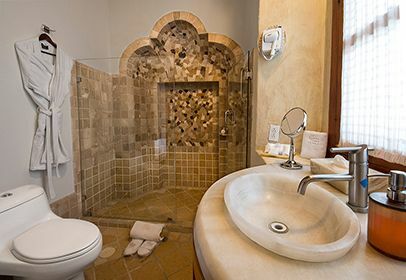 The wide bathroom, decorated with marble mosaics, includes a shower and Jacuzzi. Águila Real is perfect for romantic celebrations. 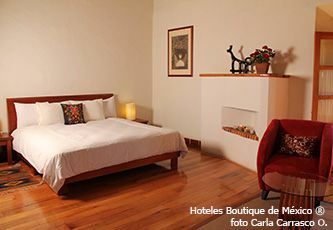 This charming suite is located in the second floor of La Quinta Luna. It includes a wide terrace where breakfast can be enjoyed. 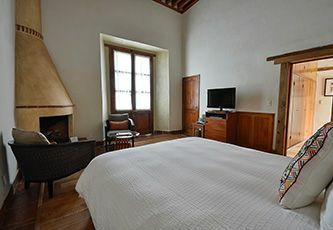 Caracol features two rooms: one with a king size bed and a flat-screen television, and the other with a large living room TV, surround system and a working area. The bathroom has a wide Jacuzzi with chromatherapy and a large dressing room. 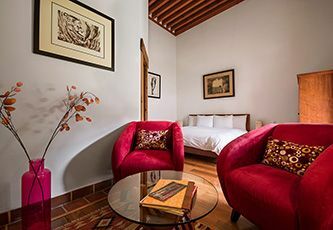 This room is perfect to celebrate special occasions like anniversaries and honeymoons, or just to relax and refurbish the spirit. To confirm your reservation, you must prepay 50% of your total stay when booking. The remaining 50% is due three day before arrival, or 7 working days before the arrival if the payment is made with American Express. If your reservation is made 7 days prior to your arrival date, full payment is required for your whole stay. For reservations with arrival dates between December 20th and January 6th, 100% payment for the total stay is required. No penalty will be charged for cancellations made 3 days or more prior to arrival date. Cancellations received less than 3 days prior to arrival date will be charged 50% of one night to credit card . Check - In: 3:00 p.m. | Check - Out: 1:00 p.m. The hotel can prearrange transportation from the Mexico City and Huejotzingo airports with prior notice. The trip is approximately 20 minutes. 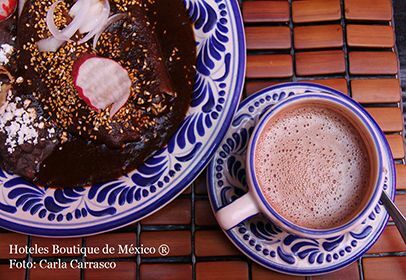 Guided tour to choose: Puebla, Cholula, Calpan or Huejotzingo. 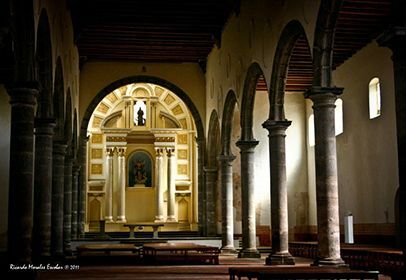 Guided tours to Archeaological ruins of Cholula, Xochitecatl, Cacaxtla and Cantona. For Cantona's tour, there is a complementary fee of $77USD. 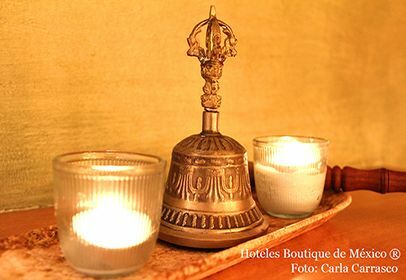 Copalli SPA is located at La Quinta Luna boutique hotel in the millenary city of Cholula, home and heritage of many pre- hispanic ancient traditions. Copalli pays tribute to antique Mexican rituals by using regional natural products as well as traditional massage techniques. Using regional flowers and other natural elements, you will reach perfect balance, giving harmony to your body, mind and soul. Enjoy this unique experience that starts with a foot exfoliation submerged in aromatic flowers and concludes with a relaxing hot stone massage. La Quinta Luna and Copalli Spa belong to this 'barrio'. Relaxing massage combines the finest massage therapy with the therapeutic benefits and detoxifying volcanic clay. Applies in soles and palms with a special wrapper leaf corn. Living legacies that provide health and wellness. Deep back massage enjoy one of the most antique techniques for corporal recovery with a deep and profound massage. Experience also the traditional technique of 'reboso'. Hot stone massage. Let yourself go by benefiting from the healing properties of a hot stone massage that will equilibrate your energy and balance your soul. Relax while you breathe and enjoy our carefully appointed aromatherapy. Back, neck and face massage. Back, neck and visage massage that eases muscular tension, releases stress and increases your wellbeing. This massage liberates you from muscle spasms and harmonizes your body. Hot maize seeds are used in this treatment to relax your shoulders and back. Relieving leg massage. Regain your vitality and indulge yourself with a comforting leg massage, followed by a maize leaf wrap and a refreshing herbal infusion. Moisturizing facial. This facial gives back your skin’s moisture and restores it by maintaining its optimal balance. This treatment is enhanced by using a natural aloe vera face mask. Recommended for all types of skin. Nourishing facial elaborated with natural flowers that will make your skin glow. Recommended for dry skin types. This balancing facial starts with the cleansing and exfoliation of the skin followed by a clay face mask. This treatment will equilibrate your skin, leaving it free of toxins. Recommended for mixed types of skin. Enjoy the unique purifying, emulsifying and energizing benefits from Copal tree. This treatment begins the cleansing and exfoliation of the skin with white Copal, followed by a clay wrap and a natural face mask. Relax and enjoy this delicious exfoliation followed by a special aromatic warm sheet wrap. This treatment will leave you in complete relief as it ends with a pleasuring relaxing massage. Take pleasure in a gentle maize grain and sugar exfoliation that will cleanse and provide glow to your skin. Enjoy a fruit based wrap and cream that will leave your skin soft and smooth. This delicious natural body treatment and its aromatherapy will leave your skin purified and radiant. A soft brushing will activate your blood circulation as a special cream will leave your skin moist and soft. Contemporary specialties from Puebla, traditional Mexican cuisine and a selection of international dishes as well.